If you have children, you likely know the often chaotic and always constant routine of running around to soccer games and sporting events, parent-teacher conferences, playdates, and a list of other activities. And, on top of everything else, you make sure that the entire family is up to date with doctor, dentist, and perhaps other medical specialists appointments. It’s one thing to be in varying places for your kids’ individual activities; it’s another thing to have to do it for dentist appointments for each family member. Choosing a family dentist could be the solution you are looking for – one dentist for all of your family’s dental needs! If you are currently looking for a dentist, here are a few reasons you should choose a family dentist. When you are constantly at work and are raising one, two, three, or even more kids, finding the time to head to the dentists for all family members amidst sports practices, PTA meetings, and challenging work deadlines can be difficult. Luckily, a family dentist provides the comprehensive dental care you need for your entire household at one convenient location, saving you both time and hassle. There’s no need to schedule appointments with different providers on different days. Instead, schedule all of your family’s routine dental checkups and cleanings together and simplify your life. While other types of dentistry focus their care to specific audiences, family dental offices provide a wide range of dental services for both adults, teens, and children. At a family dentist, you can expect to find pediatric dentistry services, preventative care like dental checkups and x-rays, restorative work, and even some cosmetic dental treatments. Some family dental offices may even offer specialized treatments for patients with more advanced dental needs, such as implants, periodontal and endodontic services, TMJ treatment, and invisible braces. They offer solutions to the unique requirements of family members of all ages. Family dental offices understand that your schedule doesn’t necessarily reflect normal workday hours. Whether you work nine to five, have a slew of after-school activities to transport kids to, or maybe are a single parent with two jobs who needs to rush from one commitment to the next – whatever the situation, family dentists are more willing to work with you and have more flexible and convenient hours that are more catered to those with a family. For many children, and even adults, visiting the dentist is something that would rather be avoided. Even older family members may even actively avoid visiting the dentist due to fear of dental exams. In addition to possessing professional education and experience, family dentists understand the different approaches to making patients feel comfortable before and during a visit, no matter the age. Keep in mind, the longer your family sees a dentist, the better the relationship will be. Each member of your family will get to know their dentist and feel comfortable with the care being provided to them. This can make it easier to express any concerns that may come up further down the road. Plus, it makes it easier for your kids to visit the dentist, as they will less likely be afraid after seeing the same dentist again. As a parent, you’ll gain peace of mind that they are in good hands. When choosing a dentist, consider a family dentist that can accommodate the needs of all family members in your household. 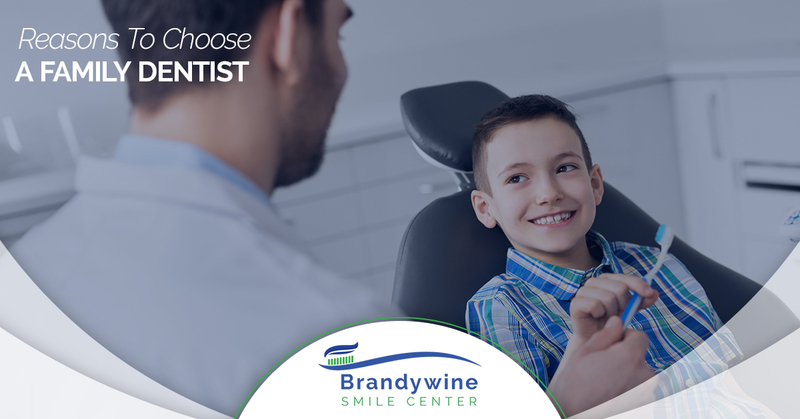 If you’re looking to eliminate the hassle of multiple dental checkups, Brandywine Smile Center offers a range of services for all ages under one roof!